A perfect magnolia for a small garden with a neat compact habit that is very easy to care for. In early spring bare stems are smothered in blush pink feathery flowers which open from rose pink buds. Blooms are much more resistant to late frosts than other magnolias. Offered as a 3L potted plants that have been expertly pruned to a 'standard' shape. Perfect in a large pot or given pride of place in the border. Likes a sunny spot and tolerates most soils. This new variety is the perfect magnolia for a small garden or for patios and terraces, with a neat compact habit that is very easy to grow and care for. In early spring bare stems are smothered in blush pink feathery flowers which open from rose pink buds. The petals are narrow, a little like ‘Stellata’ but with a beautiful pink tinge to them and an even more wonderful fragrance. What’s more, blooms are much more resistant to late frosts than other magnolias. Mid green leaves appear after the flowers, creating a beautiful ornamental tree that will become a feature in your garden all year long – especially in this standard form, creating a ball of flower and foliage atop a long straight stem. Ideal for adding height to displays, this standard form adds structure to beds and borders and is perfect for creating a feature in a decorative pot on a patio. Easy to care for, it needs little pruning except a light trim to keep shape. It likes a sunny spot but isn’t too fussy, tolerating most soils and, being fully winter hardy, you needn’t worry about it over the winter. 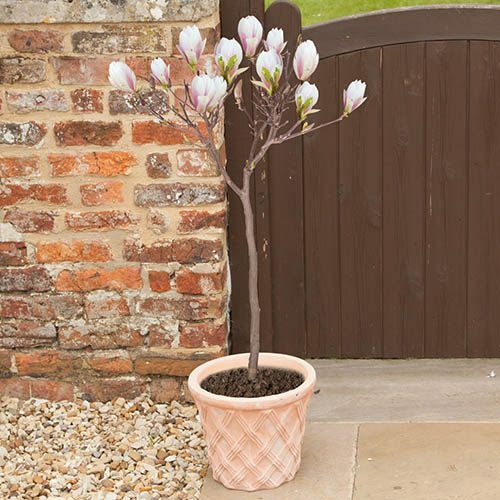 A twist on the classic Magnolia tree, this standard is wonderfully unique, eye-catching and a winner for any garden. Supplied approx. 1m tall in a 3L pot, ready to plant out or repot.